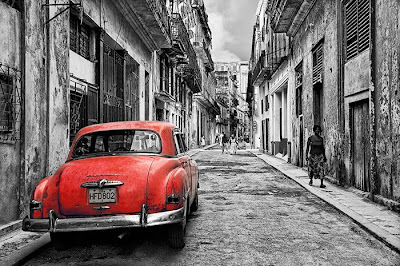 Traveling to Cuba is like traveling back in time. Cars from the 50's on many streets and much of the Cuban colonial architecture untouched. It's a photographer's dream location. I used to hand color my black and white photos and I actually still have a Marshall's Oil's set. I loved the look, but it's so much easier to do in Photoshop. I chose to work with this image for its nostalgic appeal. I painted the car red because it commands attention, it's a fun color, and it happens to be my favorite! There are many ways to hand color an image, and I used Nik Color Efex Pro. This technique is simple, and fast. I'll touch on this in my upcoming 4-week online course at BetterPhoto.com, starting in November! Look for Fabrications - Enhancing Digital Images and Creating Works of Art. Learn a lot and have fun in the process!